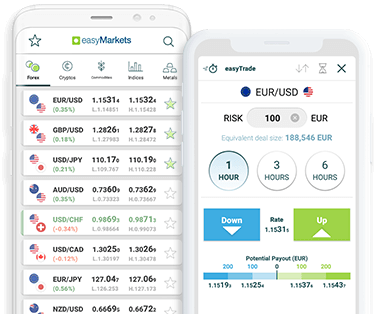 Trade BTC/USD with easyTrade, easyMarkets most innovative way to trade or Day Trade with competitive spreads and no slippage on easyMarkets platform. No slippage on web platform and App! Our exceptional support, competitive conditions and provision of the newest trading products and services keep easyMarkets at our award-winning best. There’s zero slippage on the easyMarkets web platform meaning your Bitcoin trades will be executed at the price you see on your screen. Extend your trading week with the ability to close Bitcoin positions over the weekend if you need or want to. New to Bitcoin and cryptocurrencies? We’ve got you covered with an in-depth eBook and plenty of other trading education resources. Our Negative Balance Protection means you can never lose more than you invest when you trade Bitcoin CFDs at easyMarkets.